You can place your order from the Holiday Catalogue as of Tuesday, September 1st. Do you have your list of 'must haves'? I'm afraid my list was the whole catalogue! I wanted to share some cards that were made using products from the Holiday Catalogue to get you as excited as I am about everything in it! 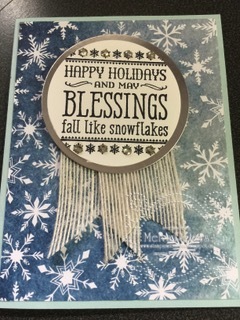 I created this card using the Six Sayings stamp set which is a Hostess set from the catalogue and the Season of Cheer Designer Series Paper. 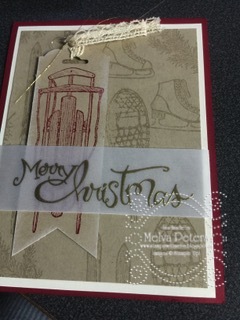 The circles are cut on Whisper White and Silver Foil. I received this card from Jenn Tinline. She's used the Winter Wishes stamp set. The cards has a lovely vintage feel! This was a stamp set that I didn't order (what was I thinking!) but I may have to change my mind! Sandi MacIver's card is amazing - I'm trying to figure out how she got such deep colours in the back ground. 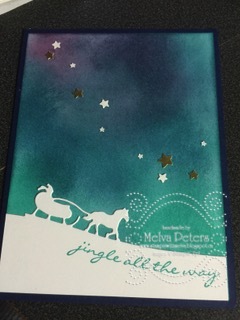 She's added a layer that is cut out using the Sleigh Ride Edgelits on top with a sentiment from the Jingle All the Way stamp set. 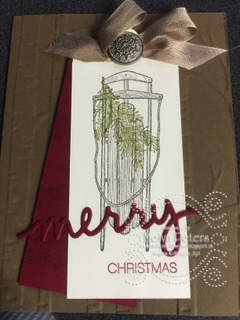 Another great card using the Winter Wishes stamp set from Alison Solven. She's using the Christmas Greetings Thinlits to cut out "Merry" and lay it over the image. Yep, another reason to add this to my wishlist! If you haven't received your Holiday Catalogue, you can email me and I'll be happy to get one to you. You can order as of Tuesday, September 1st - don't miss out! I can't wait to spend some time in my craft room this weekend playing with all of the wonderful Holiday products.